Since these have been updated, I thought it might be helpful to share with the group here. Thanks so much! 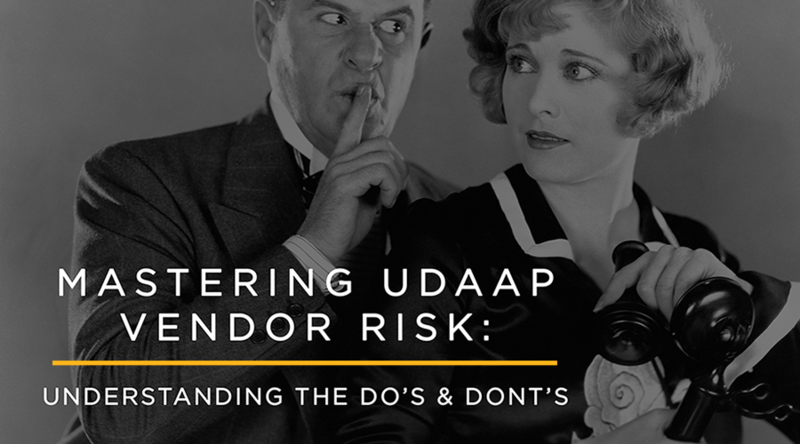 You are invited to our February webinar discussing the do's and don'ts of mastering UDAAP vendor risk. Register for free today! If you are not able to make it to the live event, the recording will be available for download afterwards. Violations of unfair, deceptive, or abusive acts or practices (UDAAP) are among the most common—and expensive—enforcement actions that banks and credit unions face. Yet these violations don’t occur in a vacuum. They are preventable with careful risk management. Don’t miss this opportunity to learn how to manage and mitigate UDAAP risk. Did you hear about this recent $11.8B UDAAP compliance settlement? As the year is coming to a close, it's time to begin preparing for compliance success in 2019! One of the top areas of focus for regulators appears to be UDAAP compliance risk. Do you know your UDAAP compliance risk? For all types of financial service providers, UDAAP risk management remains a focal point. In this blog, you will learn about a recent UDAAP settlement, and how to prepare for compliance success in 2019. We are a commercial community bank and we are starting a new residential lending department. We will sell most of the originated loans to the secondary market through a delegated correspondent program and we will not retain servicing for the loans sold. For the few portfolio loans and the interim servicing we will have a subservicer. Does anyone have Subservicing Monitoring Procedures? Do I need any policies since we will not be servicing the loans? Want some tips on how to manage vendor risks? Take a look at this three-tiered approach to defend your bank from risk exposure! This didn't come through normal channels for me (I get constant communications from the CFPB but not sure how this was left off) - hoping the rest of you were aware but if not, you may want to review! In this free eBrief, A Quick Guide to UDAAP Compliance, you'll learn compliance basics you need to know, plus 17 best practice tips to manage risk. UDAAP training sample. Tailored for our CU, so will need to modify to fit your needs. UDAAP is an important area of focus for compliance officers and financial institutions. In this post, you'll learn what UDAAP is, important definitions, and how to approach some of the key risks. In addition, you'll have the chance to download a free UDAAP info kit! Learn what UDAAP is, important definitions, and how to approach some of the key risks. This year's ABA Regulatory Compliance Conference in Orlando presented an incredible opportunity to learn and grow with other compliance officers. Surrounded by customers, colleagues and friends, I and the rest of the TRUPOINT team had the opportunity to reconnect with former coworkers and meet new friends. The ABA Regulatory Compliance Conference presents an incredible opportunity to learn and grow with other compliance pros. Here are the top 7 lessons I learned! Does anyone have a "servicing procedure" for UDAAP in their deposit area? On a recent UDAAP audit it was noted we did not have servicing procedures in the deposit area. Does anyone have a teller training for UDAAP? If you use BMA as your platform vendor, PLEASE READ THIS QUESTION! As we are all dealing with the fallout from last week's software update, do you think we have UDAAP exposure in addition to Regulation DD? I'm thinking that we should not charge fees if someone accessed their Reg Z covered, overdraft line of credit because the available balance on the line was included in the customer's available balance on the underlying checking accounts when accessed through online banking. Do you agree? What about charging interest and late fees on the line? Any thoughts would be very much appreciated.